Frank Lara will be an international observer during the upcoming presidential elections on Feb. 3. He was invited as an official representative of the Party for Socialism and Liberation by the FMLN (Frente Faribundo Martí para la Liberación Nacional). His coverage of the election can be followed at facebook.com/laralucha. On Jan. 27, the political campaigns for the upcoming presidential elections in El Salvador came to an official end. 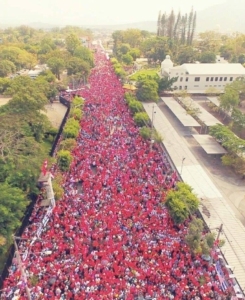 In a resounding demonstration of grassroots support, the FMLN mobilized more than 100,000 people in support of the party’s presidential candidate Hugo Martínez and Karina Sosa, the vice-presidential candidate. The celebration culminated months of campaigning. The FMLN and its candidates focused on visiting and talking to many people and community groups in cities and towns throughout the country. El Salvador is the smallest nation in Central America. In the 1980s, the country was forced into a prolonged and bloody civil war, with right-wing forces armed and supported by the U.S. government. At one point, the support by the U.S. to crush the FMLN reached $1 million per day. In 1991, both sides of the conflict signed the historic Peace Accords, which brought the armed struggle to an end. The casualties of the war totaled more than 75,000 killed with many more tens of thousands wounded. Since the Peace Accords were signed, six presidential election cycles have occurred. The presidency is a one-term mandate that lasts five years. Four out of the last six terms have been dominated by the right-wing ARENA (Alianza República Nacionalista) Party. Marred by corruption, leaders of the party ruled with complete impunity as they pocketed the wealth of public institutions and neglected the social welfare of the nation. While anger against ARENA grew, the FMLN built up its electoral campaign capacity, and in 2009 it was able to win the presidency in coalition with the well-known independent journalist Mauricio Funes. 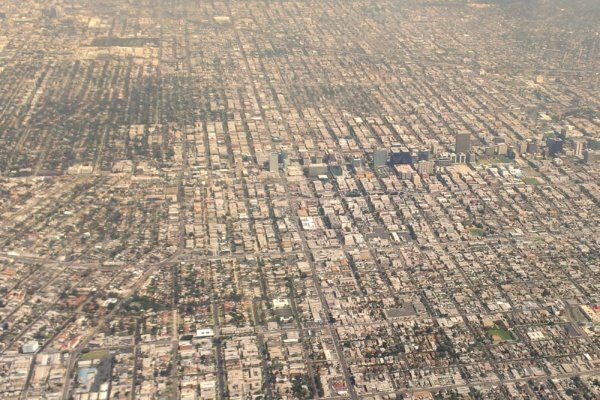 The monumental victory demonstrated that the disciplined and arduous work of rebuilding grassroots support among the masses of people could defeat a wealthy and powerful elite. In 2014, once again, the FMLN won the presidency. This time, the candidate came from the ranks of the party. Salvador Sánchez Cerén, a former commander during the civil war, showed that the majority of the population supported the FMLN without the need for it to reject its guerrilla past and its revolutionary roots. Unlike the neoliberal and corrupt ARENA Party, the FMLN presidencies focused on distributing the wealth through investment in social programs like meals and school supplies for students, subsidies for small farmers, and the expansion of retirement benefits. Important education programs like the “One Student, One Computer” program allowed the distribution of 5,000 computers under the Sánchez Cerén presidency alone. Thousands more were distributed to students of higher education during the previous FMLN presidency. Under both FMLN presidencies, through the building of health centers and the expansion of medical services, infant mortality rate dropped to 10 per 1,000 compared to 23 per 1,000 under ARENA. Also, the maternity mortality rate dropped from 50 to 32 per 1,000. Finally, the number of people who suffered under extreme poverty fell by 524,000 people. The corresponding rate dropped by 11 percent compared to a 1 percent increase under all the years of ARENA rule. While the achievements of the FMLN are important, their unwavering commitment to the poor has occurred in a period of global capitalist downturn. El Salvador has always struggled to develop a strong internal economy based on natural resources, mass agriculture, or access to ports. Without investment, and with a general decline in capital investments, the FMLN tried its best to distribute as much of the little they had to the most in need. This didn’t sit well with the middle classes whose income feels stagnant. The economy is made worse by the fact that El Salvador does not have an independent national currency, using U.S. dollars instead. As they say in El Salvador, “nos pagan en pesos y nos cobran en dólar.” “We are paid in pesos, but charged in U.S. dollars.” Most products imported from the U.S. or abroad have the same price or higher of those found in the imperialist countries. It is within this difficult and contradictory context that other candidates are likely to win, according to some polls. Nayib Bukele, a former member of the FMLN and mayor of San Salvador for three years, is seen as the front runner in this presidential election. Even though he was expelled in 2017 due to undisciplined behavior, his mayorship and former support by the base of the party allowed him to build a strong base of support. He is running with the relatively new right-wing GANA (Gran Alianza por la Unidad Nacional) Party. Polling second is Carlos Calleja of the ARENA Party, and the FMLN with Hugo Martínez is considered to be in third place. 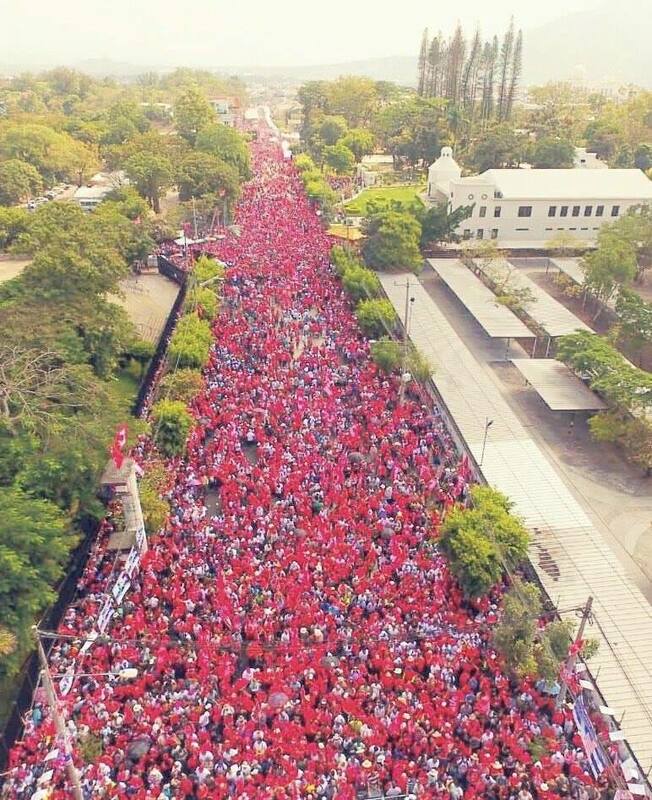 Whatever the outcome is on Feb. 3, the FMLN proved with its closing rally and the level of outreach in two months that it is the only left party capable of mobilizing the masses of people. No other candidate or party came close to the 100,000 people that were seen in the capital of San Salvador on Jan. 27. 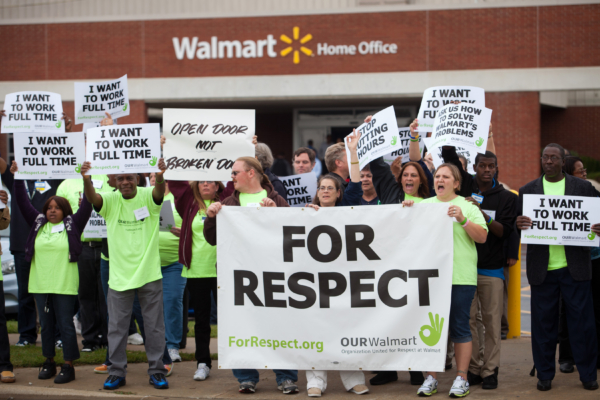 Revolutionary movements and the parties that lead them understand that this is a long-term struggle, in which the ultimate power lies not on winning or losing an election but in the recruiting and development of the working class. After the Peace Accords, the FMLN had to safely disarm and reintegrate tens of thousands of war-torn fighters into civil society. As it carried out this monumental task, it also continued to strengthen its organizing and mobilizing capacity in order to participate legally in the political life of the country. In 2015, the FMLN held its first congress to discuss the future of the struggle. It took the party 25 years to hold its first congress after having formed from five independent leftist organizations in 1980. 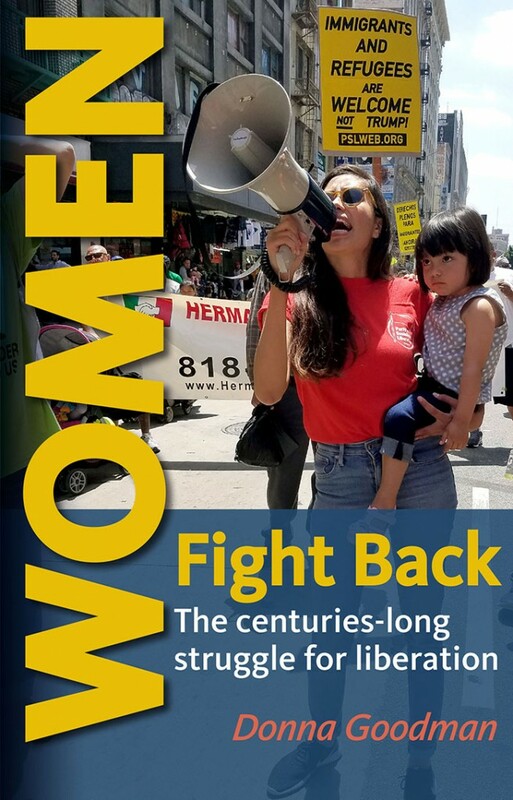 Twenty thousand members participated in more than 2,200 assemblies and determined that the future lay with developing a new leadership among the youth, reestablishing historic grassroots organizations among the working class, and consolidating electoral victories to develop a long-term strategy for revolutionary social justice. If the FMLN loses, it will be a setback, but it is far from discarding the powerful legacy and inevitable leadership role this party will have in coming years. The FMLN, as with all left governments and forces, from Cuba to Nicaragua to Venezuela, upholds an alternative to neo-liberalism and alludes to socialism under the most difficult conditions. The Yankee imperialists in the north are always watchful, showing in this moment just how vicious they can be. In Venezuela, they are openly leading a coup, blockading the nation, and stealing its assets in its attempt to overthrow President Maduro. The government of Sánchez Cerén and the FMLN have both declared support for President Maduro and demanded that Venezuela’s sovereignty be respected. No other party has the historical experience nor a more grounded revolutionary assessment of El Salvador than the FMLN. The PSL extends our strongest solidarity and support for the FMLN on Feb. 3 and beyond. We will continue resisting here in the heart of the empire so that one day the boot of imperialism may be removed from the humble people of El Salvador, so that the dream of independence and prosperity for Central America, the dream of Farabundo Martí, Francisco Morazán and Augusto Sandino, comes true.